LADD — When Rip’s Tavern fired up the deep fryers on Thursday evening, the kitchen was packed like a sardine can with eight people crammed into the narrow space, including a camera man and a set of studio lights. Brittney Payton, daughter of Chicago Bears all-time great Walter Payton and host of WGN’s “Chicago’s Best,” was getting a crash course in cooking chicken from the Rip’s crew. She threw on an apron, measured out salt and flour, mixed the batter and began plopping chicken into the fryer in front of the camera. “You don’t have to actually serve anything we make,” said a producer. But the chicken turned out well, all the same. Brittney Payton begins to deep fry chicken with the help of Jeff Rounds in the kitchen at Rip’s Tavern in Ladd Thursday afternoon. Payton is the daghter of the Chicago Bears famous running back Walter Payton. Why they’re there: The Chicago’s Best crew is doing a road trip episode, venturing out of Chicago to the surrounding areas including Pontiac, Rockford and Kenosha before trekking to the small town of Ladd. “We found some places outside of the city that people can make as a destination dinner,” Payton said. Chicago’s Best takes suggestions their fans on where to go, and when fans got wind of a road trip episode, Payton said requests for Rip’s came pouring in. Starting at the bar: To get the cameras rolling, Payton interviewed Rounds about the history of Rip’s, which is celebrating 80 years of business this year. “We weren’t going to do anything for it but then this came up,” Rounds said. Rounds said he was impressed with Payton’s demeanor during the entire shoot, which took several hours. Moving to the kitchen: Heads bobbed and weaved in the dining room, trying to get a look at just what was going on with all the cameras in the kitchen. And unfortunately for Payton, the chicken takes 20 minutes to cook, so she passed the time talking to staff and snacking on the extra appetizers. “I’m loving the leftover onion rings. I can’t wait to try the rest,” she said. On to the dining room: As the camera panned over close-ups of Rip’s menu items, the Chicago’s Best crew dug into some of the fresh-out-of-the-fryer chicken. Payton then sat down for dinner and an interview with Gina Ramey, a longtime Rip’s employee of 56 years. But the film crew made the mistake of setting silverware on the table. Brett Herrmann can be reached at (815) 220-6933 or svreporter@newstrib.com. Follow him on Twitter @NT_SpringValley. This entry was posted in News on July 22, 2016 by Rips Tavern. Thanks to Everyone who helped make Ladd’s 125’th Anniversary Celebration such an amazing success !!! You make us Proud to be from a small town and you are truly Appreciated! It wasn’t goodbye forever, but it was goodbye for a while. After 42 years as a bartender with Rip’s in Ladd, John Kopina stood behind the bar one last time before his retirement on Sunday. Kopina was in for a surprise as his family, friends, and even his former college roommate stopped into the tavern to give him a final farewell. The crowd wished him more than a happy retirement; it also gave him moral support and well wishes as he faces ongoing health challenges. In 2009, Kopina was diagnosed with Parkinson’s disease. “When life gives you lemons, you have to do something with them,” said Sharon Kopina, John’s wife. Kopina and his wife began making a permanent move to Arizona this week, not just to escape Midwestern climate like many others who migrate toward warmer states. “John will be going to Banner Neuro Wellness Center in Gilbert, Arizona,” Sharon said. Gilbert is approximately 25 miles outside of Phoenix. She added that her husband will be able to engage in several activities and exercises at the center to help him deal with the disease. Sharon said so far Kopina is only dealing with some minor tremors from the disease, and he hasn’t had any problems with his balance thus far. Rip’s was full of people whose lives were touched by Kopina, and for him that meant a lot of hugs, handshakes and reminiscing. So what will he miss the most? “It’s the people. It’s been great between the people here, and everyone else,” Kopina said. 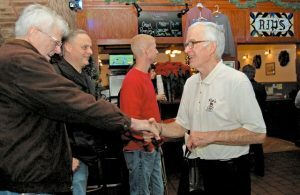 Bill Rounds, a co-owner of Rip’s, had nothing but nice things to say about his long-time employee. Besides being a staple at Rip’s, Kopina also was a teacher at Ladd Grade School for 32 years. Kopina said he worked as an educator for a total of 34 years. At the same table as Mosbach sat Gene Merkel, former Hall School Board member. It’s safe to say you probably couldn’t run into someone in Ladd who didn’t know Kopina from the school or from his time at Rip’s. “He worked for so many years here and at the school, and then to be afflicted with this (Parkinson’s) — that’s tough. But he was here every day,” Rounds said. Kopina’s dedication to his time at Rip’s did not go unnoticed to anyone in that tavern on Sunday. A longtime friend and co-worker at Rip’s says Kopina gave him a lot of good memories. Another co-worker at Rip’s who also recently retired, Gina Ramey, reminisced with John about their younger years. “We had a lot of good times when we were younger, right John? It’s harder now, that we’re older,” Ramey said. “It’s near impossible now,” Kopina said and laughed. Kopina’s wife said they will move little by little into their new apartment in Gilbert over the following weeks. “We’ll miss our family here, but we will be back and forth,” Sharon said. This entry was posted in News on December 26, 2014 by Rips Tavern. This past week was a sad one for our Rip’s family. A longtime co-worker, partner, relative, and friend passed away at the age of 96 – Ralph Grivetti. Ralph was the nephew of our founder “Rip” Gualandri. 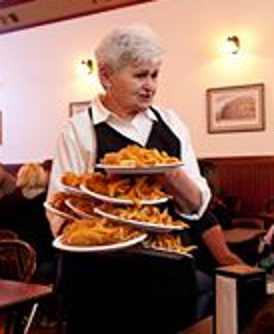 He worked at Rip’s from the age of 13 until he retired in 1980. He was a co-owner with William (Morgan) Rounds from 1976 until his retirement. 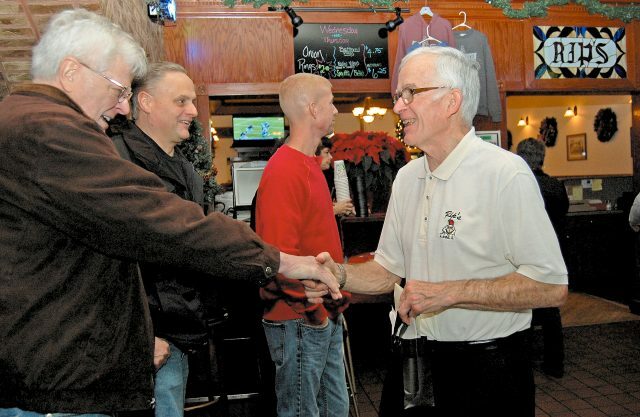 Ralph’s friendly smile and greeting was a mainstay at Rip’s. The only interruption in working at Rip’s was his service to his country in World War II from 1941 to 1945. His tour of duty included Guadalcanal, New Guinea, and the Philippines. His wife of 66 years, Marion, passed away almost 1 year ago. I am certain that they have been re-united and Ralph has a huge smile on his face. This entry was posted in News on November 2, 2014 by Rips Tavern. It’s hard to believe almost a year has passed since you retired, Gina! Thanks for all the great memories over the years. We sure do miss you!! This entry was posted in News on August 22, 2014 by Rips Tavern.